I’m really good at choosing terrible TV. Don’t believe me? I can prove it. All my favourite shows get cancelled way too soon, while other shows that should’ve been canceled ten years ago soldier on (Looking at you, Grey’s Anatomy.). Here are my top 3 favourite (now cancelled) shows from the last year. NBC put a spin on the popularity of superhero shows with Powerless. 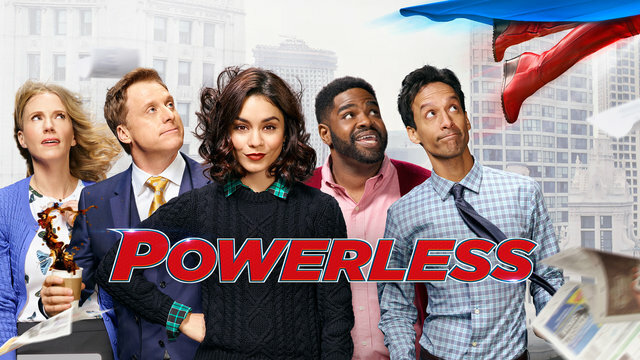 Powerless is a comedy that follows Emily as she starts her dream job as the director of research and development at Wayne Security in Charm City. A city where superheroes and villains and the everyday regular humans that are sick and tired of having to deal with the aftermath of epic battles. As the director of research and development, it is Emily’s job to motivate and inspire her team into creating the latest new product that will solve the problems of regular humans co-existing in the superhero world. It’s too bad that Emily’s team is less than interested in their mission and her boss, Van Wayne, is only interested in himself. Powerless employed some of my favourites. Alan Tudyk, who you may recognize from Firefly, another one of my prematurely cancelled TV shows, portrays Van Wayne, Bruce Wayne’s cousin, CEO of Wayne Security. Danny Pudi, from Gilmore Girls and Community, and Ron Funches from New Girl, @midnight, and the Kroll Show, are members of Emily’s development team and Emily herself is portrayed by Vanessa Hudgens (High School Musical, Grease Live). I really enjoyed the quirkiness of this comedy, and the premise was interesting and engaging. I loved the whole ensemble cast, but it was Alan Tudyk and his awesome performance as Van Wayne that made the show for me. And Powerless featured a few super cool cameos like Adam West and Marc McClure. It was a fun show. The network didn’t agree with me and Powerless was cancelled before its first season was up. Speaking of shows that were cancelled in their first season, the next show on my list finished its 13-episode run mid-season and left me wondering whether or not it was going to be cancelled for months before the network gave us the bad news. 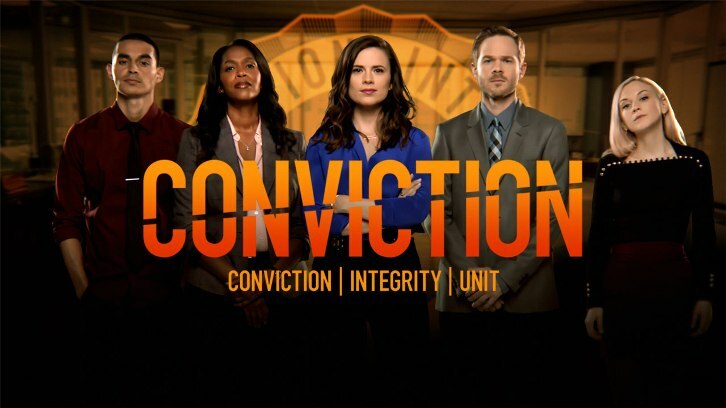 Conviction is a show about Hayes Morrison, a former first daughter, lawyer and wild child, who gets strong-armed into heading up the new Conviction Integrity Unit to avoid going to jail for cocaine possession. She and her team investigate cases where there is suspicion of wrongful conviction. The new high-profile job puts Hayes in the spotlight while her mother is running for state senate and in close proximity to her ex-boyfriend and former colleague, DA Conner Wallace. When I first found out about this show, I was a little worried because the promotional material really leaned hard on the ‘wild child’ bit. But Hayes Morrison was being brought to life by one of my celebrity crushes, Hayley Atwell. And I fell in love with Hayley because of her portrayal of Agent Peggy Carter in Marvel Cinematic Universe films like Captain America: The First Avenger, Captain America: Winter Soldier, The Avengers: Age of Ultron and Ant-Man. On TV, in the same role, Hayley guest-starred on Agents of S.H.I.E.L.D. and starred in the cancelled-after-two-seasons Agent Carter. I’m not bitter that the TV execs cancel everything I love. Not at all. Anyway. I was in mourning after the cancellation of Agent Carter, so I was just excited that Hayley Atwell was back on TV. The show turned out to be really good, with a compelling cast of characters and great stories. It wasn’t as full of horrible tropes as I was expecting. Alas, apparently the ratings weren’t there for a show with a smart, badass, queer lady lead, a diverse cast and compelling stories. Speaking of diverse casts. It’s almost too soon to talk about the last show on my list. 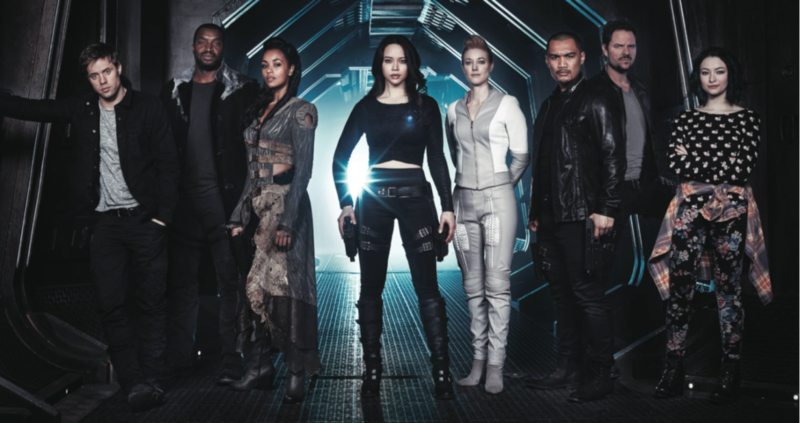 But I can’t talk about awesome shows with diverse casts without thinking about Dark Matter. From the creators and show-runners of Stargate, Dark Matter is a space opera where the crew wakes up on their ship, the Raza, to no memories of who they are or what they’re doing. As they start to piece together their past, the Raza crew, lead by badass, POC, queer woman Two (aka Portia Lin, aka Rebecca), explore what identity is all about while running from the Galactic Authority and their past lives as criminals and dangerous people. They’re trying to stop a corporate war, assassins and an android uprising, while exposing conspiracies and building alliances. It’s just all in a days’ work for the Raza and her crew. The 7 person crew has a diverse representation of different races, ages, gender expressions and sexual orientations. This crew is unlike anything I’ve seen in a science fiction show before. The show was fun, had a bit of campiness, wasn’t afraid to make jokes and created engaging stories, characters and relationships. Dark Matter’s supporting characters were great and well-casted. Their villains were complex (Hello Will Wheaton). Oh, and did I mention it was a Canadian production? And for me, it holds a special place in my heart, because my high school crush and Canadian Idol winner, Melissa O’Neil stars as the Raza crew’s leader, Two. While Dark Matter was cancelled only a few months ago, there was hope this show might be saved after the fandom rallied behind it. But after the last of 3 interested parties passed on picking up the show, it remains cancelled. Apparently, I can’t have nice things. I have to give an honourable mention to the show Doubt. Which was canceled after 2 episodes. It was a courtroom drama, starring Katherine Heigl, from every romcom in the late-oughts, and Lavern Cox, from Orange is the New Black. The main character, Sadie, played by Katherine Heigl, was boring AF. But all of the other characters including Lavern Cox’s Cameron Wirth, a transgender woman finding her way as a new litigator in a new firm, were interesting and engaging. Doubt was cancelled after 2 episodes but I honestly feel the show wasn’t given enough time to find its feet. Who knows what could have been. I really enjoyed what I saw from this show that was canceled before it even started. What is your favourite show that was ripped from the airwaves way too soon? Cancelled TV, Cancelled TV Shows, Conviction, Dark Matter, Doubt TV, Powerless, Top 3, TV, TV shows, Why is Grey's Anatomy still on the air?